Whether you lunch to break up the day, fuel up for the afternoon, or meet up with friends and colleagues, you need a good place to do it. There are many fine places to grab a midday meal in Montana, but these 10 are among the very best. Check them out. The Nova Café specializes in locally-sourced comfort food. Not only do they keep cups and bellies filled, they also strive to be an important part of the Bozeman community by supporting local artists and other businesses. The Nova Café also happens to serve breakfast all day, so you don’t have to settle for soup or a sandwich, delicious as they may be. Folks in Billings can grab a quick, yet delicious lunch at Crazy Mary’s Fish N Chips. Sweet service and always-tasty food have made this place a local fave. Fresh fish and fries made to order are the signature dish. They also serve clam strips, scallops, shrimp, and clam chowder. Although it’s only been open since 2009, Steve’s Café has proved a popular-enough spot for lunch and breakfast that they now have two locations. A scratch kitchen with original recipes and creative daily specials keep lunchgoers in the Helena area coming back for more. Whether you have a hankerin’ for a burger, some barbecue, or a big bowl of scratch-made soup, the Garage Soup Shack and Mesquite Grill is sure to satisfy. Add a craft beer to make it a longer lunch, or just grab a salad if you’re feeling all healthy. The Knead Café has a lunch dish for just about anyone. Carnivores, vegans, and those who are eating a gluten-free diet will all find something delicious on the menu. If you find yourself flagging after a long morning at work, grab an espresso drink to get you through the afternoon. Hole in the Wall Family Dining is a Miles City institution. This casual, local eatery is renowned for sweet service, great food, and piled-up portions. It’s the perfect place to grab lunch during the workweek or as you’re out and about on the weekend. If you need to take someone to a power lunch, or just treat yourself after a long week, the Uptown Café is the place to do it in Butte. They offer quick “café lunches” with entrees and soups that change daily, as well as an excellent salad bar and a daily pasta salad. The Hob Nob Café has been a go-to breakfast spot in Missoula for well over a decade, but their tasty twists on lunchtime classics also make them popular with the midday crowd. Salmon burgers and seared ahi BLTs ride the menu alongside scratch made soups and crispy, fresh salads. It’s always a good time to come in and enjoy our natural beef burger! Made with grass feed, Montana beef. Lunchgoers in Great Falls will appreciate the locally-sourced ingredients, including Montana beef and Montana-ground coffee, at Roadhouse Diner. 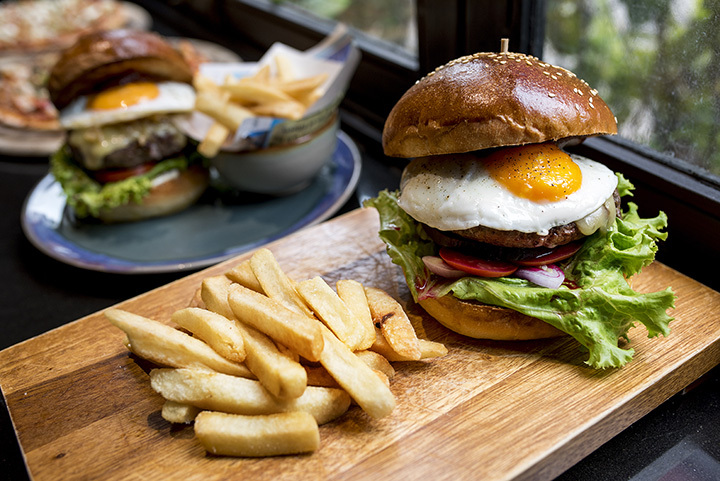 They serve huge burgers with creative toppings, as well as housemade soups. The diner also offers a regular rotation of specials and new menu items. Faye’s Café is a hopping lunch spot because of its chef’s playful creativity. The menu is populated with classic lunch and breakfast plates, but you can add a “Yumtwist” to any of them to change the flavor profile. Or you can just ask the kitchen to make something up. Seriously. “Chef’s Choice” is a menu item.